Experience a mountain of family adventures year-round in cozy, secluded Park City, situated in the breathtaking Rocky Mountains of Utah. Once a major gold and silver mining town, Park City, Utah has recently experienced a tourism boom by mining the year-round appeal of a pleasant town surrounded by majestic mountains. Many visitors fly into Salt Lake City and drive the 30-plus miles directly to this charming, sophisticated, and lively mountain town. In the winter, most come for the skiing at Park City Mountain Resort, Deer Valley Resort, and The Canyons. In February, the town is packed with bold-faced names for the Sundance Film Festival. In the summer, there is an array of activities sure to please any active family. Vacationing in Park City any time of year is an adventure, so for your next trip head to this quaint family-friendly mountain city. Utah ski resorts boast having “the best snow in the world,” which is why hordes of people from all over the world come every year to experience perfect powder and endless slopes. Skiing at the Park City Mountain Resort and the surrounding resorts of Deer Valley and The Canyons is pricey – up to $86 for a day pass in 2010 – but the charm, luxury, and vastness of these resorts make spending the money worthwhile. Snowbird, Alta, and Brighton offer the same famous snow nearby for at least $20 less per person per day, so it might be worth investing a shuttle or car ride to a neighboring resort for a day. See the Park City Mountain Resort Website and links to neighboring resorts for details on tickets, season passes, and snow conditions. 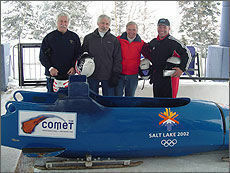 The 2002 Salt Lake City Winter Olympics put Park City on the world map. In preparation for the Games, the Utah Olympic Park was built as both a training and competition facility. It hosted the ski jumping, Nordic, bobsled and luge events. Today it serves as a training facility for athletes from the U.S. and across the globe, as well as a visitors’ center. The offerings are diverse — tours of the training facility held on the hour from 10am to 4pm for $5-$10 for the whole family, and, in non-winter months when they’re not used by athletes, several speedy and thrilling experiences for daring teenagers include a full-track bobsled ride for a pricy $200 per person. The Quicksilver Alpine Slide is a sled guided on a steel track that allows riders to weave down a narrow course; kids must be 14 and up. It’s the next best thing to the real Bobsled run-and 1/3 of the cost, which you can ride with a staff professional driver (kids 16-17 need an accompanying adult). It’s a 5G, 80 mph ride, an intense and exhilarating physical experience. Or, take an easy stroll through the Alf Engen Ski Museum, which has interactive displays that simulate skiing and snowboarding. A favorite is the virtual ski machine that lets you experience the Olympic downhill and slalom runs and a powder run from nearby Alta Ski area. The cost is $7 for adults and $5 for Senior/Youth 3-17. Every year over 200 dramatic, documentary, and short films are presented at the Sundance Film Festival located right in Park City, usually during the period from mid to late January. Established and budding directors as well as famous faces and up-and-coming actors crowd the festival, attending film premiers and award shows. A system of walking paths throughout Park City takes you between Festival venues so you can save precious energy spent fighting traffic, or you can hop on the free Festival shuttle bus. To get tickets to the festival you must first sign up online, making you eligible to register for festival passes, ticket packages, and advance individual tickets. The system then randomly assigns purchase timeslots to registrants. Prices differ depending on what type of pass or package you want to purchase. For more details on how to get tickets e-mail FestivalTickets@sundance.org or call the ticketing hotline at 435/776-7878. 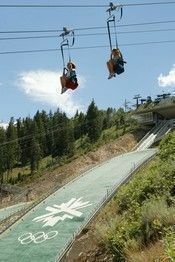 The Park City Mountain Resort offers its own menu of summer fun. 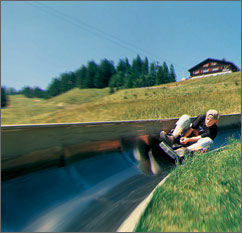 The Alpine Slide is a luge-like bobsled-on-wheels where you can race your siblings down parallel tracks to the bottom. At 48” tall, you get to solo for $11; below that, kids over age 2 ride for $3 with Mom or Dad. You’ll get a slightly more controlled ride on the Alpine Coaster; the Zip Rider drops 550 feet over a 2300 ft. run. Over 54″ in height are $20 per ride, and under 54″in height & over the age of 3 cost $7 per ride. Calmer activities include miniature golf, horseback riding, guided mountain sled tours, a human maze, a few small amusement park rides, and a trampoline/bungee experience. See the Park City Website for details about prices and locations. All three ski areas offer extensive lift-served mountain bike and hiking trails, thereby eliminating the leg-burning climb up. Both The Canyons and Deer Valley Resort offer regular outdoor musical events, with acts ranging from the Utah Symphony to bluegrass and jazz festivals. Most resorts offer great children’s programs in both winter and summer. They book up well in advance, so you need to plan ahead. 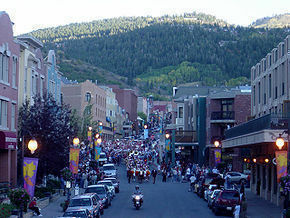 And if you’ve had enough of the great outdoors, the great indoors will welcome you for a wide range of shopping options in the stylish boutiques of downtown Park City. Some people vie for staying in the luxurious lodges located in the Park City, Deer Valley, or Canyons resorts. These lodges, located just feet from the slopes, provide a high-class experience — but at a high cost — upwards of $$$ for a two bedroom lodge unit. The average price for hotels in Park City is $$, but families traveling on a tight budget can get a great room for a lower price at the Holiday Inn Express Park City. The moderately priced hotel, though not right in the center of the action, provides a short trek to Deer Valley, The Canyons, and Park City Mountain Resort and is nearby the Utah Olympic Park, the Alf Engen Ski History Museum and other fun attractions. Next Article Next Article Free Orlando!